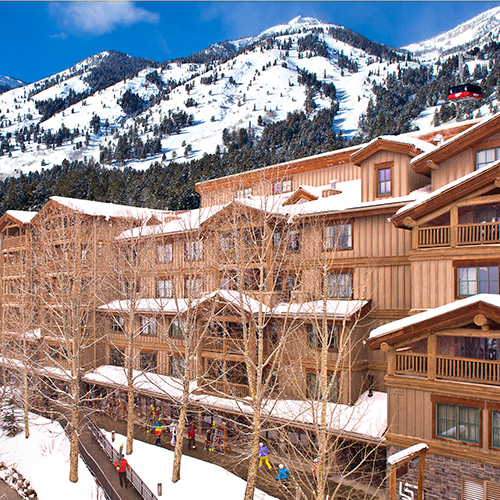 If five hot tubs, a luxurious full-service spa and a spacious rooftop patio next to the slopes appeal to you, I'd make a reservation here today. Nestled among the majestic Tetons, this slope-side resort features an upscale leading-edge lobby with the coziest of seating arrangements and mesmerizing appointments and artwork. A nice selection of alpine condos and well-appointed guest rooms is available. Some feature a walk-in shower, jetted bathtub, loft, balcony and/or patio. All have an in-room boot dryer. From the spa to the rooftop swimming pool and five hot tubs, you'll feel swept away at this retreat. Smoke free premises. 145 units, some condominiums. 5 stories, interior corridors. Accessibility (Call). Slope side at the base of Jackson Hole Mountain Resort; Upper Village. 3385 Cody Ln 83025 (PO Box 564). on-site and valet, winter plug-ins. Spur Restaurant & Bar, see separate listing, full bar. refrigerators, coffeemakers, wireless Internet (fee), safes. Some: microwaves. sauna, hot tub, steamroom, downhill skiing, snowboarding, ice skating, recreation programs, bicycles, trails, exercise room, spa. valet and coin laundry, room service, area transportation-within 12 mi. closed 4/8-5/3, check-in 4 pm, 30 day cancellation notice-fee imposed, resort fee, pet friendly (call for restrictions/fees. ).